In the United States, we indulge in eating over 3,000 calories on Christmas day (the daily recommended number is 2,500 for men and 2,000 for women). As our waistlines expand over the Christmas period, why should our teeth be negatively affected as well? It's great to enjoy treats during the Holiday season, but you need to maintain good oral health too! 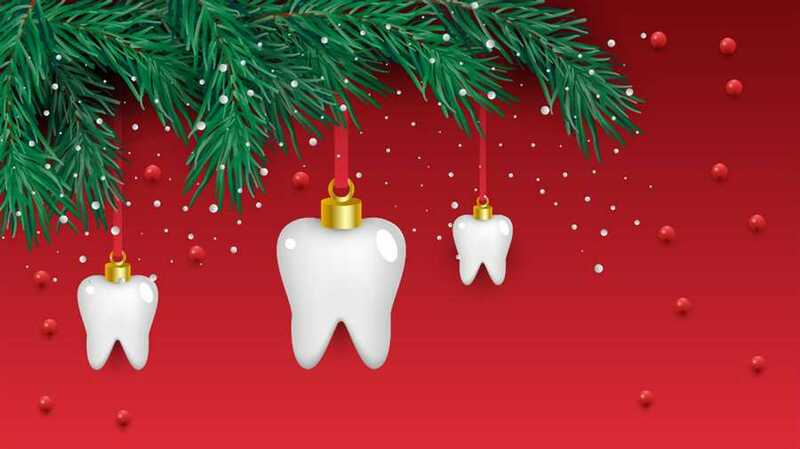 Check out these great Holiday dental tips! Overindulgence is to be expected but be selective. It can be very easy to munch away on certain snacks that ruin our teeth. Ice - chewing ice can result in a breakdown of enamel. Instead, try selecting a few foods which aren't terrible for your teeth, such as sprouts. Another great food option during the Holidays is turkey, which has nutrients that are good for the teeth, such as phosphorus. If you must have biscuits this Holiday season, stick to Gingerbread which has much less sugar than many other varieties we've become addicted to! When it comes to beverages, make sure that you're drinking clear liquids. Red wine is a culprit for discoloring your teeth and often makes them feel sticky. If you just can’t resist wine during the holidays, then try to nibble on cheese at the same time. Although this sounds too good to be true, the alkaline in the cheese will balance the pH level in your mouth. Are you guilty of occasionally forgetting to floss or brush after a long night out? The Holidays are NOT the time to be letting your standards slip. If necessary, take a toothbrush and some floss out with you. This way you will remember to clean your teeth directly after heavy eating and drinking sessions. It is important to remember that you should be brushing your teeth for two minutes, flossing and gargling twice a day. This will save you from an expensive dental bill after an expensive Holiday season! It is smart to also remind your family to floss and brush! The Holidays are full of fun activities and although this chore may feel like a drain, it will payoff in the long run. Who wants a toothache while trying to enjoy a turkey dinner? You should remember how many more years of delicious Christmas dinners you'll be able to enjoy if you maintain good dental health! The daily amount of water recommended to drink is 15.5 cups for men and 11.5 cups for women. When you've overindulged during the holidays, don't punish yourself. Instead, make sure you drink a LARGE glass of water. It's quite easy to consume large amounts of treats and alcohol, while forgetting to drink water during the big binge season. However, this magical liquid can really make a big difference with your dental health. In fact, water has been proven to prevent cavities and tooth decay. Fluoridated water is ideal, as this will help strengthen your teeth. It is especially important to drink water after eating. This will help wash away any bacteria left in your mouth and will dilute acid from alcohol. Water will also help you avoid getting the meat sweats. A final added benefit of water is its unique quality of filling you up without adding any calories. If you're still feeling hungry after your large dinner and are thinking about seconds, have a glass of water instead. It's great for your waistline and your teeth! Did you know that biting your nails is not only bad for your nails but it’s also very damaging to your teeth? It will result in erosion or chips on your front teeth. Biting your nails also wears away enamel and can result in sensitivity. Painting them in festive colors to avoid the desire to ruin them! Ask your family to relieve some of the stress of the holidays. During the Holidays, many individuals are also guilty of using our teeth for practical tasks. For example, opening presents or even bottles with teeth is quite common. If this is one of your habits, we recommend finding a new one! Your teeth will thank you in the long run. It is strongly recommended to schedule a post-holiday cleaning or preventative treatment before the Holidays even begin. You should always note your appointments on your calendar, as this can very easily slip your mind when you're juggling house cleaning, cooking, buying presents, and seeing family. There is usually a high demand for dental visits after the Holidays, so booking in advance helps ensure you reserve an appointment time. If you are due to see the dentist in December, don't cancel your visit because Christmas is a busy time of year. It is important to always put your dental care first. When it comes to anything in life, including your holiday dental care, prevention is better than treatment. Ultimately, developing a dental care routine is the best way to preserve your teeth this season. It is wise not to overindulge in sugary snacks between meals and drink substantial amounts of water. Do you need a checkup before or after the Holiday season ends? Get in touch with us today to schedule an appointment and keep your dental health in check!